So you know how beauty is in the eye of the beholder? That adage is never more true than when you visit a modern/contemporary art museum. That's what I kept repeating to myself, walking around ICA's exhibition galleries today - while I really liked Charles Ledray's workworkworkworkwork exhibition, I wasn't so keen on Dr. Lakra's. The ICA permanent collection was also neat, composed of several different artists and mediums, with some really great pieces that make you think. Hard. So, that's where that beholder thing comes into play. I heard others ooohing and aaahing over the Lakra, and I agree, his body of work is was quite amazing. I can't even imagine the level of details he goes into to research tattoos and local lore for his art. But, I can admit, it's not my taste. On the other hand, the miniature work of Ledray was quite something else. It took me several pieces to get into his work, but after I got the concepts, it was all about the details. The exhibition included about 50 pieces ranging from 3,000 black porcelain, 2-inch vessels to a Cooper Union Square street installation to tiny little overcoats and bears and human bone carvings. No kidding! There were a few of the pieces that I really dug - the U.S. military uniforms, the street installation, a really cool toy chest, the towers of superduper cool mulitcolored tiny vessels. But, what I love is discussing the pieces, and hearing what the artists intended. 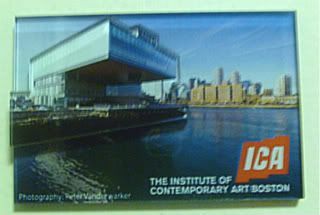 ICA has a cell phone audio tour, so I could hear the background on select works. My mother didn't use the tour, so it was interesting to see what her imagination led her to. With all that...the reason I was there, was to see the awesome building here on this magnet, designed by the same architects as New York's High Line and Alice Tully Hall. So supercool.